Although it doesn't seem like it, we are already in to the third week of Making Christmas, where did week 2 go?? If you haven't already come across the Making Christmas Blog Hop, it is the brainchild of Janine and Rebecca who came up with the wheeze of asking fellow bloggers to post a list of the crafty projects they would like to complete before Christmas and link them up. Along the way there will be posts and tutorials on holiday-themed projects, this week's post is by the very talented, paper-piecing Queen, Kristy who has designed an adorable Christmas Robin Wreath paper-pieced pattern, where does she find the time?? The pattern will be available for free download from Kristy's Craftsy shop, but only for a limited time, so if you would like it you will need to be quick. Having made zero progress on my Making Christmas list last week, I was hoping for better things this week, and I am pleased to report that I have managed to tick one thing off of the list. Yay! 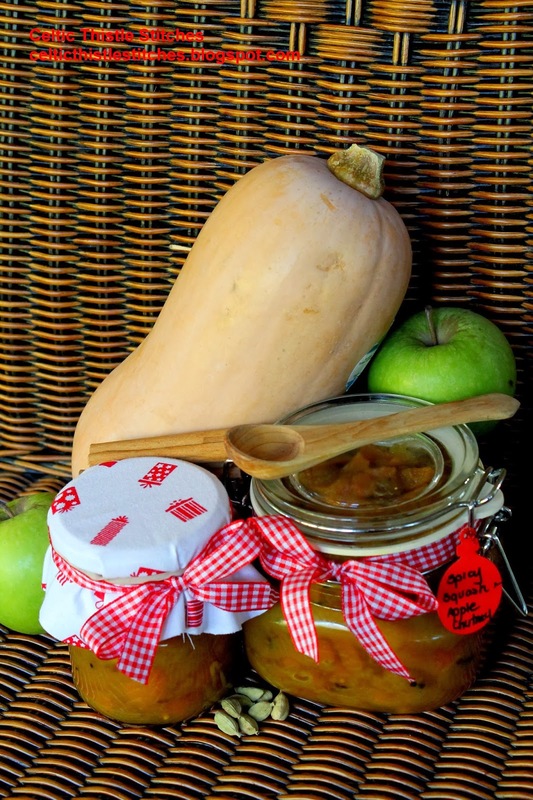 The recipe for the Spicy Squash and Apple Chutney was from the October issue of Good Food magazine and is available here I used Butternut Squash in my chutney, but it would be a great way to use up the leftover pumpkin flesh if you are carving up pumpkins this week! I enjoyed making this so much that I have decided to make some biscuits for cheese and put together a hamper for my brother. He is a very difficult person to shop for, but loves his cheese so I think that might just hit the spot. A Knotwork Christmas cushion - for me! I hope you have been having a more productive couple of weeks than I have! It's *always* time to break out the voddie ;o) Sounds like a plan for your brother though! Yummy chutney. I think I need to make a list and get going with it too. Hampers make great Christmas presents and filled with homemade goodies, even better. Ooh good plan on the chutney, bikkies and cheese! Those gifts are always appreciated - and home made is brilliant! Nice work on ticking something off your list! The chutney looks tasty, I think this will be on my to do list next year!